JULY 2018 • FOODSERVICE EQUIPMENT & SUPPLIES • 55 with adjustable shelving dividers mak- ing it easy for staff to separate various items. "Product now comes out of the boxes and the items are organized neatly and everyone can see the inven- tory better," says Palmer. New chrome shelving sits along the wall next to the dry goods storage and keeps dishes much closer for staff. Additional shelving and polymer dunnage racks in the freezer enable everything to remain off the floor here. And, in the walk-in cooler, upgraded shelving replaces mismatched items. The new shelving maximizes corner space by using S-hooks to eliminate corner posts, making it easy for staff to get the most out of the available space. A high-density shelving system in the walk-in cooler also enables staff to use an active aisle system with the goal of maximizing space. Also new: mobile polymer storage racks for pans, polymer dish dollies for banquet dishware and an additional grid wall system to hold utensils. More stor- age was also created above a secondary prep sink area, specifically set up to hold lids. This area was repurposed from its former use as a dish-washing station. A new humidified holding cabinet enables staff to hold items at temperature, and two additional transport holding cabinets make it easier for staff to wheel food across the parking lot. Add to the list six more smaller insulated pan carriers. The Big Reveal and Post-Analysis "The kitchen actually had a lot of space, it just wasn't being used properly. We can be more efficient now with the equipment we have," Palmer says. "The functional- ity of the kitchen greatly improved. It's all in a smaller footprint. It's tighter and just makes sense now." For example, with utensils, Palmer says "everything kind of went in a dumping zone before, now it's in an exact spot. Intuitively now, you put the spatula next to the other spatulas you see on the wall." Another noticeable change for Palmer: "Those old rolling racks that staff push across the property for events, which tended to fall over when they hit gravel, we can now push with one finger." A number of people on the staff avoided peeking in to check the proj- ect's progress, instead opting for the big reveal. It didn't disappoint. "Everyone agrees it's amazing," says Palmer. He's now noticing some side ben- efits that extend beyond the kitchen. For starters, one executive saw what a difference a little spackle and paint can make, which made the team want to touch up other areas on the property. "There is a domino effect going on right now," Palmer says of the after- math of the makeover. "For example, moving the dry storage to a different area opened up space for paper prod- ucts in that old room, which ultimately gave the housemen a better spot to store tables and chairs." 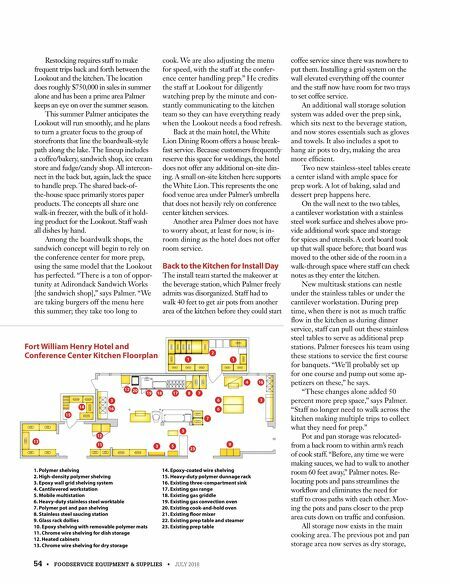 Palmer notes that he also found some new best friends along the way as multiple personnel on property would wander by to ask about old shelving as it moved out to make way for new units. "Everything was repurposed," he says, "and those old painted shelves work just fine for maintenance to store paint cans and the like." Beyond even the increase in functional workspace, Palmer says he's thrilled to realize it makes people feel better about coming to work. "It's fun to watch the team take the space over." 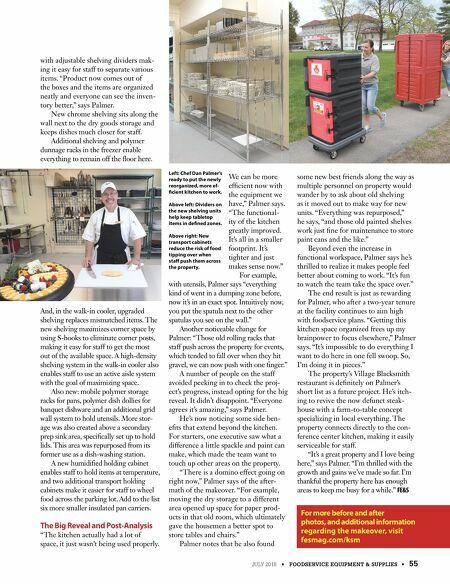 The end result is just as rewarding for Palmer, who after a two-year tenure at the facility continues to aim high with foodservice plans. "Getting this kitchen space organized frees up my brainpower to focus elsewhere," Palmer says. "It's impossible to do everything I want to do here in one fell swoop. So, I'm doing it in pieces." The property's Village Blacksmith restaurant is definitely on Palmer's short list as a future project. He's itch- ing to revive the now defunct steak- house with a farm-to-table concept specializing in local everything. The property connects directly to the con- ference center kitchen, making it easily serviceable for staff. "It's a great property and I love being here," says Palmer. "I'm thrilled with the growth and gains we've made so far. I'm thankful the property here has enough areas to keep me busy for a while." FE&S For more before and after photos, and additional information regarding the makeover, visit fesmag.com/ksm Left: Chef Dan Palmer's ready to put the newly reorganized, more ef- ficient kitchen to work. Above left: Dividers on the new shelving units help keep tabletop items in defined zones. Above right: New transport cabinets reduce the risk of food tipping over when staff push them across the property.